Manufacturers and producers are facing constantly growing challenges to meet all guidelines for quality assurance of production processes and environments, such as the Good Manufacturing Practice (GMP), and their own requirements for economy and efficiency. Many companies shy away from this double challenge, but it should actually be an inspiration to look for smart solutions that connect both sides. The example of bagging shows that this is feasible in practice. In the bagging and filling of products from the chemical industry, GMP must also be fulfilled throughout the value-added process. It starts with attaching the bag, filling and sealing it up to transport to the robot, palletizing and load securing. Producers must consider regulations such as GMP/FDA 21 CFR, EU GMP guidelines, IFS FOOD, FSSC 22000 (ISO/TS 22004) and customer audits during this process, amidst other requirements. They include safety (the product must not contain any foreign objects) and hygienic construction to avoid the risk of product contamination. Easy-to-clean systems in which no precipitates can accumulate are also needed. Concerning containment, sealed containers are preferred among producers so that the product does not come into contact with the environment. While transparent proof of quality is needful, ergonomics in plant operation and safety, especially when filling hazardous goods, must also be taken into account. With these requirements, can producers also work towards optimizing production efficiency such as increasing performance and reducing downtime? Is it even possible to have 3,300 hours of more production time per year? Yes. As hygiene regulations take effect, the economic efficiency of production is increased at the same time. 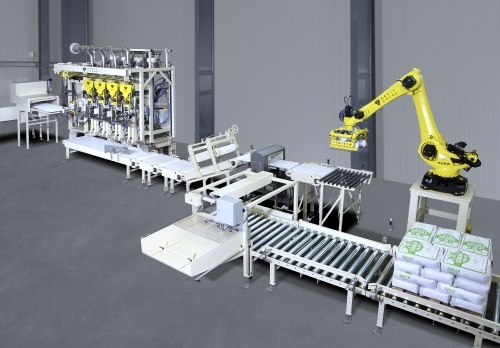 Reagens, a German manufacturer of PVC stabilizers, had previously used two manual lines for filling difficult flowing products such as micronized waxes and wax mixtures. At the same time, the company wanted to modernize and automate its filling and packaging. Coupled with several product changes on the line daily, it would require cleaning in order to meet hygiene requirements. This meant downtime, as product residues are lost in the event of a change. About 1-2 kg of product often remains in the boiler, translating to cost and manual labor to clean the boiler. The company thus installed two GREIF-VELOX air packers at its German site. The systems have new construction forms, materials and an air flushing system, which left significantly lesser product residues remain in the product vessel than usual for this industry. They provide short cleaning time of five minutes with its product vessel outlet, compared to the previous of 30 minutes. The plant has eight nozzles and three shifts per day, requiring 24 cleanings daily. The systems thus saved the factory ten hours of cleaning daily, which translates to 3,300 hours more for production in a year. Sensors that are installed in systems generate quality data, as they monitor the weight and temperature of the product to be filled. If a company has filling systems with sensors and has a check weighing process, it can derive further advantages from these systems. For example, each bag on each nozzle can be tracked to the checkweigh station. At this point, an algorithm can have a tendency to control the next sack, which can save up to 120 g per bag. This even exceeds the regulatory requirements concerning calibration ordinance and less product is wasted. With a system with eight nozzles and a capacity of 1,500 bags per hour, the result can lead to savings of €760,320 (US$880,488.82) per year. From these two examples, companies can implement GMP while improving their profitability, with creative thinking.